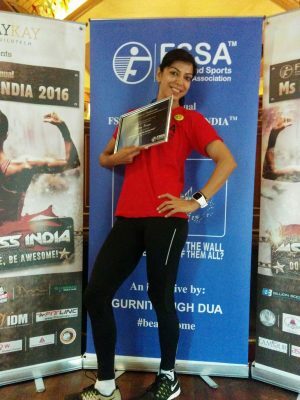 I, Ratna Verma, age 45 years, recently participated in a fitness contest called ‘ Fitness and Sports Sciences Association (FSSA) 2016 which was an Amateur fitness contest but had guidelines of a professional body Contest. It was a well-organized event held at Tivoli Gardens, Mehrauli with over 25 participants from all over the country. It was delightful to see women working towards their fitness irrespective of their ages or social backgrounds! Being fit doesn’t mean you can’t get inspired anymore! 8- A small introduction about what fitness means to you and the ramp round . For me, who has been in this line of fitness and strength training for over 25 years it was a great opportunity to take a step forward and focus on achieving the guidelines set forth by the event. I wanted to take my training to a new level and challenge myself. I began my training a month prior to the contest and all credit goes to my trainer, Jotraj Singh Bajaj , who helped me to attain that level of strength and determination. I used to workout twice , once in the morning I would practice for the contest and in the evening , do my general training of one body part each day and some cardio and abs ; so in a day I was dedicating nearly 4-5 hours on my training . Slowly, I was able to lift very heavy and cut down my cardio and running that month to retain strength and avoid muscle loss. My food: Diet plays an important role and I started eating clean,more carbohydrates like boiled red / brown rice and chicken in each meal especially more during lunch and at dinner, a smaller portion of rice and chicken with limited spices and sautéed veggies , 2 boiled potatoes without salt just half an hour before my workout regime of the contest .I did cut down on sugar and coffee though but was allowed sweet indulgence of a bite of chocolate in between my sets during the workout. ble to complete it with proper form and posture . Also while practicing for 1 RM of body weight of bench press , I had been practicing to lift at 90 degrees and push it up. But on the final day they wanted us to touch the rod right till the chest and then bring it up and for me that was difficult and I was able to lift only up to 50 KGS. What has this contest done to me: Having participated and giving my best to the fitness guidelines has given me a high that my body is fit, healthy, strong and have been able to stay away from diseases like thyroid, blood pressure that ail women of my age. It takes up discipline on daily basis to keep myself going. I pat myself for my efforts, everyday! A message to my girlfriends: Train your mind for a fitter body n never feel guilty of taking out time for yourself to exercise….never say I can’t…. About Ratna – Her quest for running began nearly 6-7 years ago with the Airtel Delhi Half marathon and there has been no stopping ever since. From panting while running a km to covering a full marathon last year, it’s been a journey of hard work, discipline and self-belief. Her love for Baking comes out through her small home run bakery called ‘Ratsie’s Boulangerie’. She customizes tea-time cakes and desserts using the choicest of ingredients. For her “Baking is love made visible ” and ” No one can be sad holding a cup cake”.